John White Ferguson was the second son of John Ferguson, a well-known yacht builder. As with many scholars he was a keen debater, advocating for both compulsory Greek and compulsory military service! He showed sporting ability from the start, winning the quarter mile and hundred yards at his first Athletic Sports competition. He became a keen cricketer whilst at Westminster and played for the school’s 1st XI, as well as for the King’s Scholars own team. As a footballer his kicking was described as being ‘particularly fine’ in The Elizabethan. His work kicking and tackling was ‘admirable’ in the Charterhouse match of 1908 – although clearly not quite enough to save the game which was lost 4-0. Upon leaving the school he was apprenticed to his father in the shipbuilding trade. 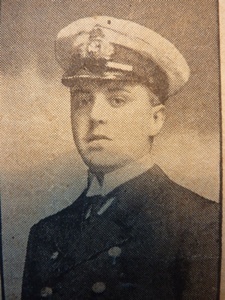 In April 1913 he joined the Clyde Division of the Navy. On the outbreak of war he took part in the siege of Antwerp and received a Distinguished Conduct Medal. In March of 1915 he was transferred to the Mediterranean Expeditionary Force. He was killed in action in the aftermath of the 3rd Battle of Krithia on 4th June 1915.